Thought the Panasonic Lumix GH5 was the 4K capture king? Think again, for the new GH5S comes with more pro-spec video magic than you can shake a stick at, without the sky-high price point. Designed around the very same body as the GH5, the GH5S only presents minor cosmetic changes to the original hybrid mirrorless camera. It's what's inside that's the biggest shift: a 10.2-megapixel multi-aspect ratio sensor offers dual native ISO sensitivity (more on that in a bit) and ditches the sensor-based image stabilisation and record time limitations, which will be ideal for those working with rigs. In short, the Lumix GH5S looks to be a hugely accomplished pro-spec 4K capture device. But with the larger-sensor Sony A7S II available for a similar price point, does Panasonic's push into this space make best sense? GH5 vs GH5S: What's the difference? 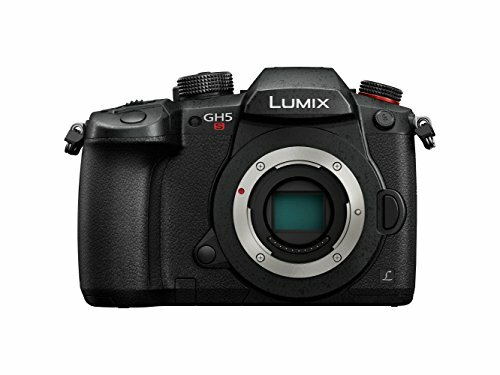 Like we say, the GH5S is only visually different to the GH5 thanks to the "S" on its front, the big red "REC" button up top, and the little red collar around the drive mode (a la Lumix G9). The GH5S's sensor is roughly half the resolution of the GH5, though. Which many amateurs might think is madness - surely more is better, right? - but makes perfectly good sense, as each of those "pixels" on the sensor's surface is 1.96x larger by comparison. That gives them almost twice the light gathering prorperties, for a cleaner signal and better low-light performance. (Note, the GH5S doesn't have enough resolution to offer the 6K Photo mode of the GH5, because there simply aren't enough on the sensor). That sensor also isn't image stabilised in the GH5S. Again, this might sound like a drawback, but in scenarios where the camera is fixed to a moving rig - especially an erratic one - a stabilised sensor may "jump around", ultimately breaking the shot that's desired. Image stabilised lenses are compatible, however, so there's some benefit to handheld work if this route is of preference. The GH5S also has a faster readout from sensor than the GH5, meaning it's better to handle rolling shutter issues. And that's another advantage it'll have against the Sony A7S II: that larger sensor won't output as quickly, so the smaller, less resolute sensor of the Panasonic takes an advantage when it comes to shooting fast-moving action. What's this Dual ISO sensitivity about, then? Next up there's the Dual ISO sensitivity, which is a stellar feature of a camera at this level. Seen in the likes of the Panasonic EVA1 pro-spec camera - which, by the way, costs some £6,500, not the £2,200 of the GH5S - the sensor has two analogue circuits after each "pixel", offering base ISO 400 and base ISO 2500 without amplification. If you know you're going to be shooting in low-light conditions, selecting the higher-sensitivity option will provide a cleaner output with less noise, as that four-figure ISO 2500 sensitivity isn't being amplified. Well, not unless you shoot at higher sensitivities, which you can - up to ISO 51,200 as standard or ISO 204,800 extended - which are very well handled. We saw demos at ISO 12,800 and the high contrast and lack of colour noise in shadows is mighty impressive. Dual ISO sensitivity can function automatically or be selected manually, ensuring that those brighter scenes can make the most of the wider-yet dynamic range at the lower sensitivity setting. This is for the cinema nerds, so be prepped for a barrage of numbers. While the GH5 can handle Cinema 4K capture - that's the 4096 x 2160 ultra-wide standard - at 24p and in 4:2:2 10-bit colour, the GH5S can do so at 24/25/30p, or 50/60p with direct HDMI output for external capture (50/60p is possible on SD card capture, but only in 4:2:0 8-bit colour). Standard 4K capture - that's 3,840 x 2160 - is the same between GH5S and GH5. That being: 60/50p capture at 4:2:0 8-bit, or 24/25/30p at 4:2:2 10-bit. At Full HD - that's 1920 x 1080 - the GH5S can capture at an impressive 240p, upping the 180p rate of the GH5. As the GH5S has a multi-aspect ratio sensor, however, it has an additional tricks up its sleeve. As the area of the senor being used can be changed by the camera, it's possible to adjust capture aspect ratio without changing focal length. And with Anamorphic 4K CinemaScope shooting options - including desqueeze display, with selectable 2.39:1, 2.35:1, 16:9 and 1:1 video guide lines - the GH5S is a true cinema capture champion. The GH5S also features V-LogL pre-installed, which is a pay-for extra in the standard GH5. This container format allows shooting in Hybrid Log Gamma (HLG), which is ideal for broadcast HDR (high dynamic range). It's pretty rare for a consumer camera to handle timecode well, but the GH5S is perfectly setup for it. With a BNC Conversion cable included in the box, the camera's flash sync terminal can be used for TC IN/OUT. If you wish to use an external multi-track audio recorder then timecode sync is possible via HDMI - which is perfect if you're shooting with multiple microphones and cameras. An XLR Microphone Adapter (the DMW-XLR1) is also sold separately. So there we have it: the Panasonic Lumix GH5S does truly look like a pro-spec 4K Cinema capture machine, without the prohibitive price tag. Ok, so £2,200 is hardly small change. The S model is £500 more than the GH5, given its mass of video-focused features and unlimited recording ability (that'll shift it into a different tax bracket from a stills camera), but with its raft of high-end features it's pocket change compared to the professional cinema rigs. However, at only £200 less than the Sony A7S II the GH5S may pose a conundrum for some. The Sony's larger full-frame sensor opens the door for more creative control when it comes to shallow depth of field. It's not going to be as good when it comes to fast-moving action, while its lack of Dual ISO Sensitivity means the Panasonic will more than compete when it comes to low-light shooting. It's hard to call the Lumix GH5S a consumer product, but for higher-end users this will be the small-scale, affordable and capable 4K product they've been waiting for. And you needn't wait long: the GH5S will ship from 15 January 2018.